This is a quick note to say that back in May 2017 I left my lab at NASA and took a new job as the Director of Advanced Technology at Zymergen. This is an amazing company that is pushing the boundaries of science — We are a molecular technologies company, and we engineer the DNA of microbes to turn them into cell-factories. These engineered microbes can then be fermented in giant tanks to economically produce bio-molecules which are enabling new advanced materials and products for the world, and are shifting our economy to a more sustainable bio-based industrial base. And, as you can imagine, there are so many fields of science and technology intersecting here that I’m in my happy zone of constant learning and innovation. You can also read more about what we do on our Technology Blog and Company Blog. Due to our resounding successes with our clients, we are rapidly scaling and constantly hiring. Come join our team! I’ll post more eventually, but currently I’m heads down on many exciting projects. Tagged with advanced technology, AI, biotech, DNA, fermentation, genetic engineering, materials, molecules, Robots, synthetic biology. While many of the tensegrity robots we built over the years had strange shapes, like the spherical SUPERball, I always held a vision of making biomimetic robots which could move and walk like animals and humans — this should ultimately be possible given the assumption that tensegrity design principles are central to how our bodies are designed, but it is a big challenge and will ultimately involve a much more complex system than the simple rod and string models we are currently working with. Nonetheless, some progress was made over the years. Unlike the SUPERball project, this line of work was never properly funded, so it made progress as a variety of different students became interested in aspects of this topic and pushed it forward a few more steps. This post will attempt to summarize the many different threads in this multi-year effort and point to the papers we wrote for deeper reading on the topics. Most efforts to make walking robots have started by focusing on legs, usually bolting fancy legs to rigid boxes for torsos. This is, of course, a bit backwards from how nature designed walking animals. Spines were driving locomotion in fish long before legs came around, and it seems certain that legs evolved within the context of flexible dynamic spines driving the fundamental aspects of motion. 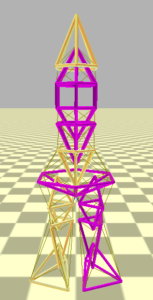 Thus, I decided to start there and focus initially on tensegrity spines, and figuring out how they might be designed and move. Since I was not yet working with legs or arms, this meant that the first round of robots looked a lot like tensegrity snakes crawling across various terrains. I had the good fortune of working with Brian Mirletz for many years, a brilliant phd student (now graduated) who dived deep into creating tensegrity spine robots, building out the NASA Tensegrity Robotics Toolkit simulator to support the work, and developing complex machine learning tools to tune neuroscience inspired Central Pattern Generator (CPG) controllers to make these robots move over various terrains, and even move towards specific goal locations. If you want to learn all about this, read his thesis. Or, for fun inspiration, watch the video below showing a series of increasingly capable snake robots, which culminates in a version that developed a realistic slithering locomotion pattern based off the combination of its morphology and machine learning. 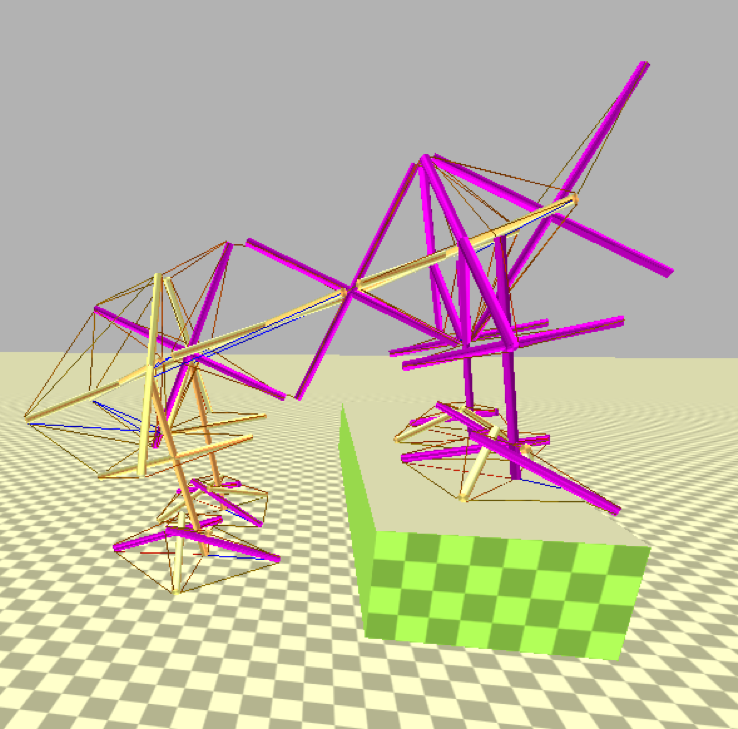 Brian T. Mirletz, Perry Bhandal, Ryan D. Adams, Adrian K. Agogino, Roger D. Quinn, Vytas SunSpiral, “Goal-Directed CPG-Based Control for Tensegrity Spines with Many Degrees of Freedom Traversing Irregular Terrain”, Journal of Soft Robotics, Vol. 2, No. 4, December 2015: 165-176. doi:10.1089/soro.2015.0012. 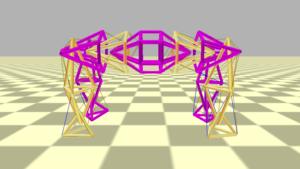 Download PDF ..
Brian T. Mirletz, In-Won Park, Roger D. Quinn, Vytas SunSpiral, “Towards bridging the reality gap between tensegrity simulation and robotic hardware,” In Proceedings of of The 2015 IEEE/RSJ International Conference on Intelligent Robots and Systems (IROS 2015), Sept 2015, Hamburg, Germany. Download PDF. 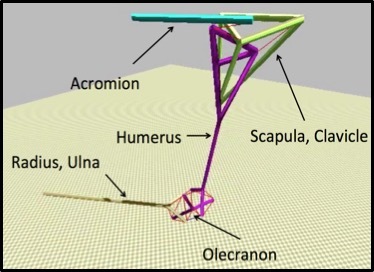 Brian Mirletz, Roger D. Quinn and Vytas SunSpiral, “CPGs for Adaptive Control of Spine-like Tensegrity Structures” In Proceedings of 2015 International Conference on Robotics and Automation (ICRA2015) Workshop on Central Pattern Generators for Locomotion Control: Pros, Cons & Alternatives, May 2015, Seattle, Washington, USA. Download PDF. Brian T. Mirletz, In-Won Park, Thomas E. Flemons, Adrian K. Agogino, Roger D. Quinn, and Vytas SunSpiral, “Design and Control of Modular Spine-Like Tensegrity Structures”, in Proceedings of The 6th World Conference of the International Association for Structural Control and Monitoring (6WCSCM), Barcelona, Spain, July 2014. Download PDF. Brian Tietz, Ross Carnahan, Richard Bachmann, Roger Quinn, and Vytas SunSpiral, “Tetraspine: Robust Terrain Handling on a Tensegrity Robot Using Central Pattern Generators,” In Proceedings of2013 IEEE/ASME International Conference on Advanced Intelligent Mechatronics (AIM 2013), Wollongong, Australia, July 2013. Download PDF. Andrew P. Sabelhaus, Abishek K. Akella, Zeerek A. Ahmad, Vytas SunSpiral, “Model-Predictive Control of a Flexible Spine Robot”, in Proceedings of the 2017 American Control Conference (ACC), Seattle, WA, May 2017. Download PDF. Andrew P. Sabelhaus, Hao Ji, Patrick Hylton, Yakshu Madaan, ChanWoo Yang, Alice M. Agogino, Jeffrey Friesen, Vytas SunSpiral, “Mechanism Design and Simulation of the ULTRA SPINE, A Tensegrity Robot.” In Proceedings of The ASME 2015 International Design Engineering Technical Conferences & Computers and Information in Engineering Conference (IDETC/CIE 2015). August 2015, Boston, Massachusetts. Download PDF. While currently unpublished, Drew has also been building hardware versions of the ULTRA SPINE, and working on incorporating it into a physical quadruped robot. Another student, Jennifer Case, came from a soft robotics lab. 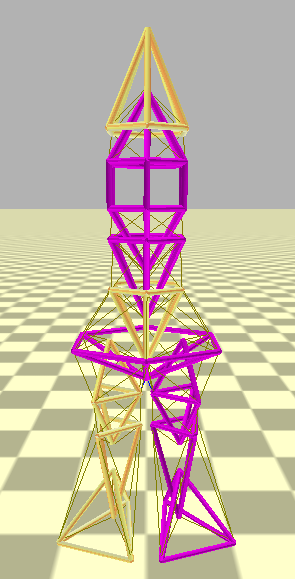 Her work was not exactly tensegrity focused, but explored another important aspect of designing robotic spines. She focused on the question of how one designs a spine with soft flexible disks between the vertebrae, and how one consequently controls the motion of the spine. The key goal of her work was to show that one could get more effective control of the spine, using fewer cables by spiraling the control cables around the spine, in a more biologically realistic manner. Most soft robot spines and tentacles focus control cables along linear paths on 3 different sides of the spine, which makes understanding the controls easier. Once you start spiraling and crossing the cables around, their effect becomes far more coupled and complicated, but it appears to have advantages. In Jennifer’s published works, she took the first steps along this path and made a planar spine where the cables crossed through the vertebrae, and was able to demonstrate improvements of the resulting system. Watch her future work! Jennifer C. Case, Edward L. White, Vytas SunSpiral, Rebecca Kramer-Bottiglio, “Reducing Actuator Requirements in Continuum Robots through Optimized Cable Routing”,Journal of Soft Robotics, October 2017. Download PDF .. Adding Legs to the Spine! As hinted by Drew’s work, the next step after all the snake robot work was to add legs and create quadruped tensegrity robots! For this, I ended up working with Dawn Hustig-Schultz, a phd student at UC Santa Cruz, who picked up Brian’s work and started extending it. Her first step was to add some legs to one of the spine robots, for which she pulled inspiration from Tom Flemons’ “Big Puppy” designs. The initial designs were very compelling, showing a nice balance of flexible terrain adaptability and stability of form, and she named it MountainGoat. In the pictures you can see where we “dropped” MountainGoat onto a simulates surface of random blocks. It was able to naturally adapt with its compliant spine to complex terrain situations, such as having a front foot up on a block and the opposite back foot on a block. This adaptation happened passively, as an inherent property of the mechanism, and no active control was required. A traditional stiff robot would have been very challenged by this situation. The next challenge was to get the robot to walk. For this we adapted the same Central Pattern Generator control scheme from the snake robots, and the machine learning used to tune the parameters. When we first started exploring how the robot would move, we found that there were many limitations to the original design — everything from the feet absorbing too much of the motion energy and not enabling good stepping, to the spine being too floppy — when the robot tried to pick up its leg what actually happened was that the shoulder dropped down and the foot never lifted. This gave us the insight that an important role of the spine and torso is to stabilize the hips and shoulders so that you can hold them in place while lifting a foot. This required adding spiral muscle lines to the torso to gain control of the hips and shoulders — and this is not really that surprising since we see similar spiral lines in the musculature of animals, and something that we also explored in Jennifer Case’s work discussed above. One can read more about the details in the following two papers that Dawn wrote, and in her Masters Thesis. Dawn Hustig-Schultz, Vytas SunSpiral, Mircea Teodorescu, “Morphological Optimization for Tensegrity Quadruped Locomotion,” to appear in Proceedings of 2017 IEEE/RSJ International Conference on Intelligent Robots and Systems (IROS2017), Vancouver, Canada, Sept. 2017. Download PDF. Dawn Hustig-Schultz, Vytas SunSpiral, and Mircea Teodorescu, “Morphological Design for Controlled Tensegrity Quadruped Locomotion”, In the Proceedings of the International Conference on Intelligent Robots and Systems (IROS), Korea, October 2016. Download PDF. 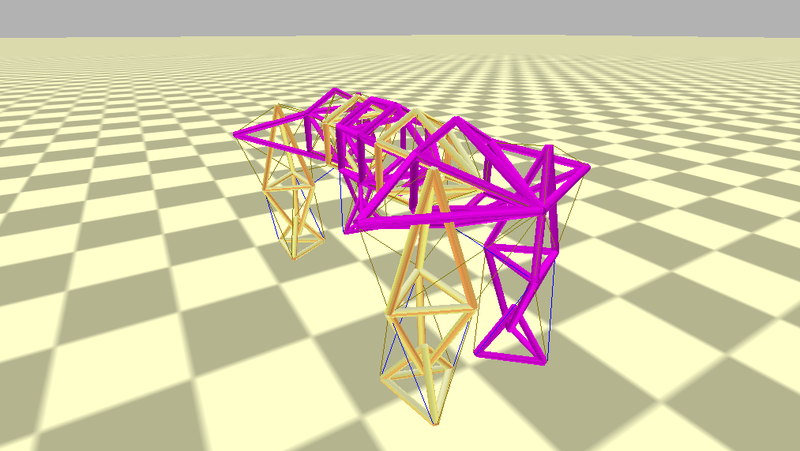 Taking another design strategy, Lauren Sharo, a student from UCSD, built a number of tensegrity quadrupeds and bipeds based off of the workspace optimized joint developed by Jeff Friesen. Jeff had developed an optimization process to maximize the workspace and available actuation power for a high degree of freedom tetrahedral based tensegrity joint (details of this are in a paper currently under review). Lauren’s theory was that effective control of the quadruped would require the ability to apply actuation force in a wide range of vectors, depending on how the terrain interaction was affecting the distribution of forces into the robot. Given the underlying optimization of the joints she used, I was very excited about this direction. When we did drop tests of quadruped onto random block fields, it also showed very good properties of passive adaptation to random terrains. Sadly, the summer ended too soon, and no controllers were ever attached to these robots, so we were not able to explore how well they could move. Likewise, there was never a publication about the work, so these are the only images of them to have escaped the lab. As you can see from the photos, she also worked on making a basic two-legged humanoid like robot (though with no arms). 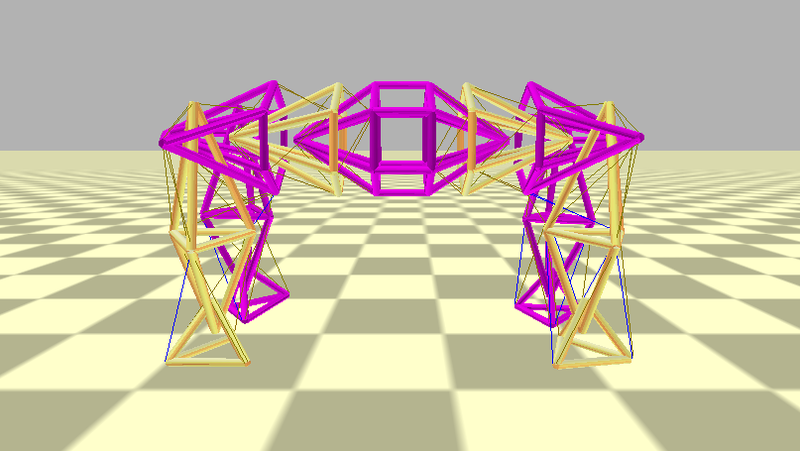 Having worked on spines, and legs, and even basic humanoids, the next obvious question is to explore how arms and shoulders might work in a tensegrity robot. Steve Lessard, an inspirational student from UCSC, took lead on this line of thinking. I was impressed by Steve’s ability to inspire many other students at UCSC to participate in his efforts and quest to understand tensegrity arms. For this work he studied a lot of anatomy and took significant inspiration from Graham Scarr’s book “Biotensegrity: The Structural Basis of Life.” With that background, he started designing a tensegrity elbow, and then developed shoulders, and finally combined them all together into a single integrated arm. The key is that he was always building both simulated arms and hardware versions which we could then control to move and do simple tasks. 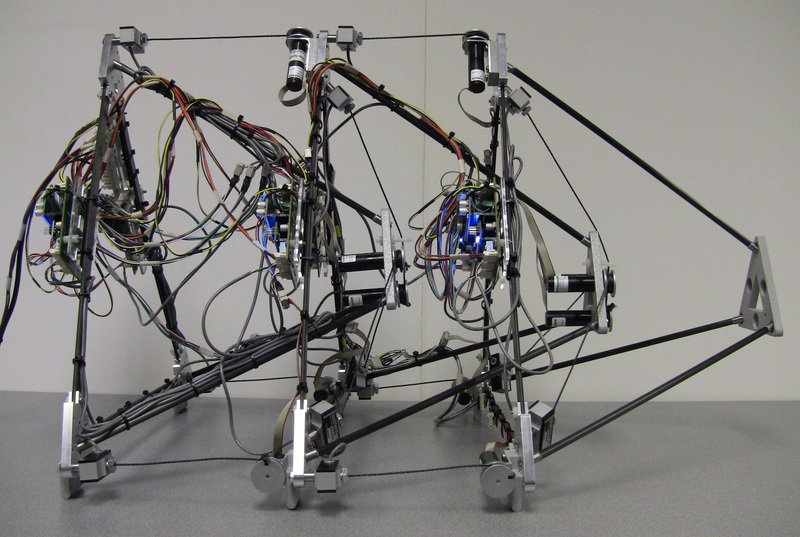 I was delighted to see this work mature over the years, because it gives a great starting point for how tensegrity robots could be designed and used to solve complex real-world manipulation tasks someday. There is still a long way to go, but the combination of natural compliance, high degrees of flexible adaptation, and the ability to control purposeful motion is pretty exciting. You can read more about his work in the series of papers he authored with the help of many other students. Steven Lessard, Dennis Castro, William Asper, Shaurya Deep Chopra, Leya Breanna Baltaxe-Admony, Mircea Teodorescu, Vytas SunSpiral, and Adrian Agogino, “A Bio-Inspired Tensegrity Manipulator with Multi-DOF, Structurally Compliant Joints”, In the Proceedings of the International Conference on Intelligent Robots and Systems (IROS), Korea, October 2016. Download PDF. Leya Breanna Baltaxe-Admony, Ash S. Robbins, Erik A. Jung, Steven Lessard, Mircea Teodorescu, Vytas SunSpiral, Adrian Agogino, “Simulating the Human Shoulder through Active Tensegrity Structures” In Proceedings of ASME 2016 International Design Engineering Technical Conferences & Computers and Information in Engineering Conference (IDETC/CIE 2016), August 21-August 24, 2016, Charlotte, NC, USA. Download PDF. Steven Lessard, Jonathan Bruce, Erik Jung, Mircea Teodorescu, Vytas SunSpiral, “A light-weight, multi-axis compliant tensegrity joint”, In proceedings of 2016 IEEE International Conference on Robotics and Automation, (ICRA2016), May 2016, Stockholm, Sweden. Pre-print available on arXiv. Download final PDF. Steven Lessard, Jonathan Bruce, Adrian Agogino, Vytas SunSpiral, Mircae Teodorescu, “Robust Monte Carlo Control Policies to Maneuver Tensegrity Robots out of Obstacles,” In Proceedings of Autonomous Robots and Multirobot Systems (ARMS). May 2015, Istanbul, Turkey. Download PDF. One of the powerful things about tensegrity structures is that the structure itself is exactly in line with the lines of force in the structure, with the elements either being purely in tension (cables) or purely in compression (the rods). Thus, there is a very close coupling between the design of the structure (its “morphology”), and the control required to move it around. One of the things you can see from all the above work is that we were manually creating different physical designs for the robots, and then developing (manually or using machine learning) controllers to move the robots around. It was very clear from this experience that small changes in the physical structure could have huge impacts on how well the robot could ultimately move, even after using machine learning to find the “best” controller for it. Thus, it was my intention to extend our machine learning techniques to co-optimize both the physical morphology and the controller at the same time. This is a challenging endeavor, and becomes computationally quite difficult. 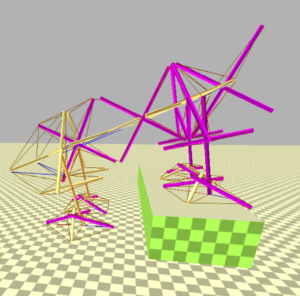 Practically, our simulator was not setup for this, so we put significant effort into developing the ability to computationally define morphologies. While we got close, the ultimate goal of co-optimizing tensegrity brains and bodies together has not yet occurred (most of the tools are there in NTRT if someone wants to try). But, along the way I had the pleasure of working with Nick Cheney, who’s phd focused on exactly this question of co-optimizing morphology and control in soft robots. His work was never focused on tensegrity robots, but I learned a lot from collaborating with him in the last years of his thesis work. I highly recommend that anyone interested in this topic follow up on his research. Nick Cheney, Josh Bongard, Vytas SunSpiral, Hod Lipson, “Scalable Co-Optimization of Morphology and Control in Embodied Machines”, under review. pre-print on arXiv. Nick Cheney, Josh Bongard, Vytas SunSpiral and Hod Lipson, “On the Difficulty of Co-Optimizing Morphology and Control in Evolved Virtual Creatures”, In The Proceedings of The 15th International Conference on the Synthesis and Simulation of Living Systems (ALife), Mexico, July 2016. Download PDF. I’m delighted by all the progress that has been made on this front. I hope that future generations of tensegrity robotics researchers are inspired and explore these ideas further — we have explored many of the key elements required to start assembling fully biomimetic tensegrity robot. A key thing that stands out from this effort is recognizing that the design of a tensegrity robot that moves is very different from the design of a static tensegrity form that might look like a dog or person, but which has no capacity for actively controlled motion. To really mimic biological levels of motion, I think we ultimately need to imagine many tensegrity structures super-imposed on each other, each one representing an optimal balance of forces for a part of the possible range of motion. Thus, this would require thousands of actuators — which we see in our bodies if you realize that our muscle fibers are the actual basic unit of actuation, rather than the large muscle groups that we tend to think about. We are a long way from having a practical artificial muscle technology that is flexible and compact enough to mimic muscle fibers, but progress is being made. Perhaps when it happens, the ideas explored here can really come to fruition. I also want to thank all the inspirational and talented students who shared this vision with me over the years, and who made this work possible. As you can tell by the many co-authors in the papers above, many many more folks contributed to these efforts than I have had room to name in this post. I learned so much from each of you, and could not have done it alone. Thank you. Tagged with biomimetic, biomimicry, biotensegrity, CPG, humanoid, motion, MPC, neuroscience, physiology, quadruped, Robots, snake, spine, tensegrity. I would like to take the opportunity to highlight the work of Jeff Friesen, one of the most talented robot designers I have had the pleasure to work with! 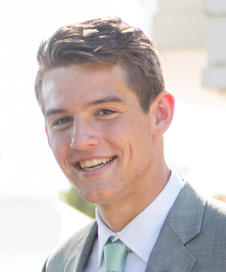 He is a PhD student at UCSD in the Coordinated Robotics Lab, who has been working with our lab both as a summer student, and as a central part of our team for the last few years with the support of a NASA Space Technology Research Fellowships (NSTRF). 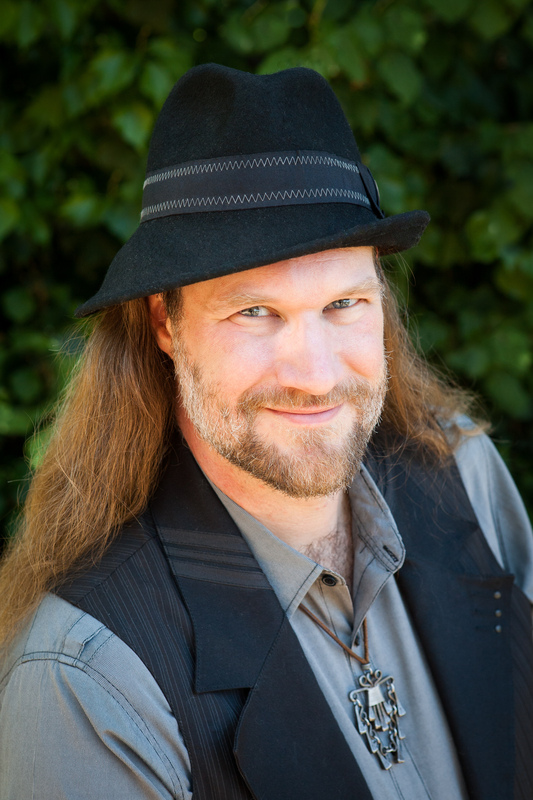 Jeff is delightfully talented at mechatronic design and controls algorithms, and has built a number of very innovative tensegrity robots over the years. With his rapid iteration on building new robots, he has encountered and addressed a number of unique design challenges that are common to many tensegrity robots, and a number of his ideas have been integrated into our current SUPERball 2.0 robot designs (which he also participated in developing). 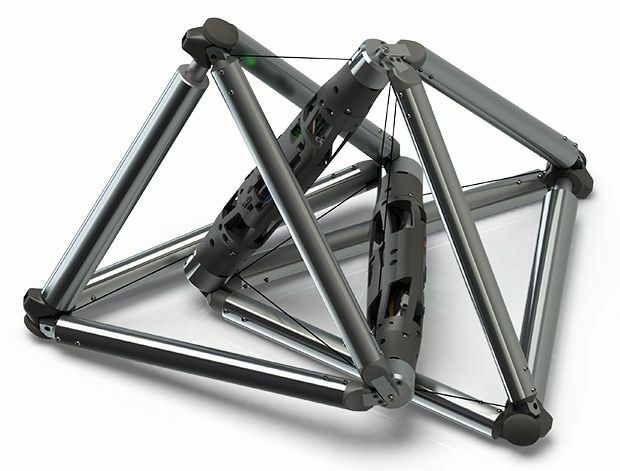 namely the Duct Climbing Tetrahedral Tensegrity (DuCTT) Robot. The intent of the robot was to develop a machine which could climb and maneuver through tight constrained spaces, such as ducts in buildings, or small tunnels or natural crevasses. The challenge is to be able to both lift and move in a vertical shaft, while also being able to turn corners. Because most duct systems (and all natural tunnels) have complex internal features, simply using wheels to roll along is not sufficient, but instead requires that the system be able to lift and place limbs of some sort. In attempting to address all these requirements with more traditional designs, past efforts have generally resulted in overly complex mechanisms which are too heavy or fragile for real use. 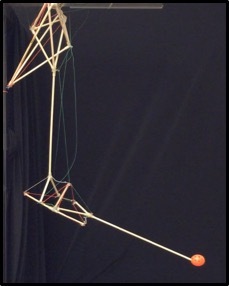 As is often the case, designing a robot with tensegrity principles in mind, Jeff was able to develop a simple and light weight solution which can climb and turn as required. The system is composed of 2 tetrahedral sections, connected by a network of cables, which enable the sections to inchworm up the shaft. In fact, there could be as many modules as needed, if a longer robot with different payloads or sensors was required. Each tetrahedron has a linear motor in one of the bars to control the width of the tetrahedron, allowing it to press and hold firmly against the shaft, or tuck in compactly to move around an obstacle. This next video shows DuCTT climbing up out of a vertical shaft. Since it is a bit hard to see all the details of how the robot moves, the next animated video (based on the first generation robot) shows how the inchworm action occurs. Finally, the following video shows DuCTT exercising its full range of motion, which shows how it could turn a corner within a duct system. Jeffrey Michael Friesen, Michael Fanton, Paul Glick, Pavlo Manovi, Alexander Xydes, Thomas Bewley, Vytas SunSpiral, “The Second Generation Prototype of A Duct Climbing Tensegrity Robot, DuCTTv2”, In proceedings of 2016 IEEE International Conference on Robotics and Automation, (ICRA2016), May 2016, Stockholm, Sweden. Download PDF. Jeffrey Michael Friesen, Alexandra Pogue, Thomas Bewley, Mauricio de Oliveira, Robert E. Skelton, Vytas SunSpiral, “A Compliant Tensegrity Robot for Exploring Duct Systems”, In Proceedings of International Conference on Robotics and Automation (ICRA), Hong Kong, June 2014 Download PDF. Tagged with NASA, NSTRF, robot, tensegrity, UCSD. There has been some nice media coverage of our Tensegrity Robotics research “recently”. I’m a bit behind on updating this blog, so “recent” really means “in the last 6 months” or so. Most exciting is an interview by Zygote Quarterly. This is a magazine dedicated to bio-inspired design, and the interview gives some nice insights into how I’ve found inspiration in fusing engineering and biological inspiration in developing the field of tensegrity robotics. And since it is a design magazine, its really pretty with some nice inspirational photos. Worth the read! Next, back in January the BBC released a nice short video about our research. I always appreciate when someone does independent research and pulls together a story including prior videos and information we have released. It is so refreshing to see given how much of online media is slapped together with minimal effort and is often wildly inaccurate, especially around science topics. As usual, the BBC continues to maintain standards for real content. Thanks! 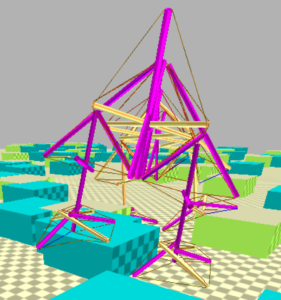 And, now to give this post some more fun technical content — back in May we presented a Tensegrity Deep Learning paper at the International Conference on Robotics and Automation (ICRA) that was developed jointing with our colleagues at UC Berkeley who led the algorithm development. In it we demonstrated the first example of learned continuous locomotion on the actual SUPERball robot. What is particularly amazing is that we were able to do all the training in simulation, and have the learned policy work directly on the real robot. This is unusual in the world of robotics, and I believe that it highlight the value of flexible, compliant robots like our tensegrity robot — the compliance that makes it resilient to unexpected contact also makes it robust to approximately tuned controllers. You can read the paper, find the code, and more on the project website. Tagged with interview, media, NASA, Robots, superball, tensegrity.